It's my first day at a new school and the only person I know is my cousin, Zoe (but she might be a little too cool for me). I was just another scrawny kid until a group of ninjas recruited me into their clan. It was a world of trouble I wasn't prepared for. This diary is a warning: the life of a ninja is dangerous, scary...and awesome. My name is Chase Cooper, and I'm a 6th grade ninja. Being the leader of a ninja clan isn't easy - especially when half of my ninja clan quit. This week started with 'Talk Like a Pirate' day, and it looks like it's going to end with an all-out pirate invasion. The entire school is in danger, and I'm the only one who can save it. It all started when some kid stole my book bag, and set off an avalanche of disaster that turned into the worst week of my life. I'm number one on the school's most-wanted list, and I've just found out about a rival ninja clan - the red ninjas. Things are looking bleak, but ninjas never quit...and neither do their enemies. Rival ninja clans, pirate overlords and now a sneaky evil genius - at my school, things don't stay quiet for long... The science fair is coming up, and things are going smoothly - until some supervillain starts stealing science projects and destroying them. Oh, and leaving me anonymous notes and trying to frame me. It's going to be a long week. 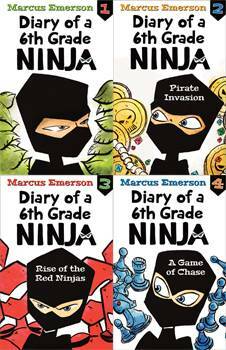 Marcus Emersonis the author of several highly imaginative children's books including the popular Diary of a 6th Grade Ninja series and the Secret Agent 6th Grader series. His goal is to create children's books that are engaging, funny, and inspirational for kids of all ages - even the adults who secretly never grew up. He is a comic book reader, video game player and toy collector.